Varnishing is an essential part of the painting process used to change or unify surface sheen and protect a painted surface from the environment and ultraviolet light. There are many misconceptions about whether or not it is necessary to varnish an acrylic painting. As a general rule, all acrylic paintings should be varnished. Even though acrylics dry fast to a durable and flexible film, there are a number of important benefits to varnishing a piece of work. Liquitex varnishes come in several different sheens, which can all be intermixed for a customized sheen. Liquitex varnishes are either permanent or removable and can be applied to both flexible and rigid supports. For interior use only. Excellent leveling properties, durable, non-yellowing, and permanent. Translucent when wet – dries clear. High Gloss Varnish For interior and exterior use. Excellent leveling properties, durable, non-yellowing, and archival. Clear in the wet state. Can be used on oil & acrylic paintings. Remove with mineral spirits or turpentine. Protect colours from ultraviolet light. Any varnish will afford some protection but those with UV inhibitors offer extended protection from colour fading. Choose a desired varnish and sheen. Permanent varnishes are non-removable and should always be tested before applying to your work. Make sure that your painted surface is completely dry (between 72 hours – 2 weeks depending on thickness) before applying any varnish. Only apply varnishes in a work environment that is clean and free of dirt and dust. Apply 1-2 layers of Gloss Medium & Varnish as an isolation barrier before applying. Let dry 1-3 hours between coats. Allow to dry 48 hours after final coat. Clean the surface with a lint free rag dampened with mineral spirits. Apply 1-2 layers of Soluvar Gloss Varnish. Allow 24 hours drying time between coats. Use only “true” mineral sprits (not odorless) to thin Soluvar if needed. Do not shake the varnish. Shaking can introduce bubbles that will form and dry on your painted surface. Apply in 1-3 thin coats, rather than 1 thick coat. A thick coat will take longer to dry, may dry cloudy, drip or sag during application and has a greater chance of showing brush strokes when dry. Place the work to be varnished flat on a table - do not varnish vertically. Thinned varnish is more susceptible to producing bubbles. Do not be vigorous in your application. Apply in long even strokes to cover the surface top to bottom while moving from one side to the other. While working, inspect the varnish layer at all angles for bubbles. Even them out immediately. Once you leave an area, do not go back over areas that you have done. If you do, you risk dragging partially dry resin into wet, which will dry cloudy over dark colours. If any areas were missed, allow to dry completely and re-varnish. When applying Liquitex Matte or Satin Varnish, apply no more than 1-2 thin coats as thick applications may result in cloudiness when dry. If more than 2 coats are desired, first varnish with Gloss Varnish to the desired thickness and apply Matte or Satin Varnish as the final coat. 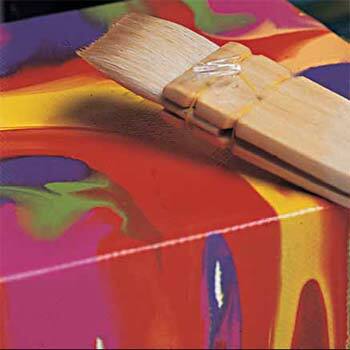 Airbrush applications of varnish are recommended for heavily textured work or vertical applications (such as murals).